OCI Solar Power uses sheep as "lambscapers"
What do solar power and sheep have in common? They’re both good for the environment: solar panels generate clean, carbon-free electricity, while sheep eat grass – lots of it. They’re now working together at Alamo 2, a 4.4-megawatt solar farm off Binz-Engleman Road. The sheep arrived at Alamo 2 in April and have done a great job of keeping grass low and out of the way of the solar panels, Samaie said. 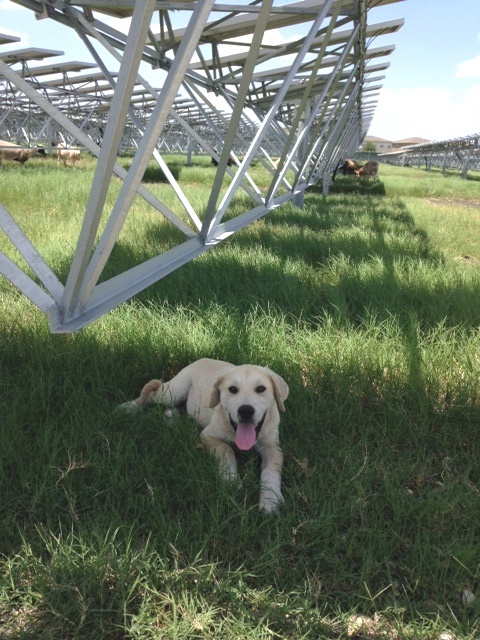 OCI Solar Power is keeping an eye on the farm to determine whether it will use sheep at future sites. The breed of sheep at the farm, Barbados Cross, can withstand extreme temperatures better than other breeds because of its ability to find shelter. The nearly 18,000 dual-axis solar panels at the farm, which follow the sun as it moves across the sky during the day, provide plenty of shade for the rams and ewes at the site. They’re also better at finding their own food and so don’t require supplemental feeding to survive — and there’s plenty of native grass on the farm to keep these sheep satisfied. This solar farm is also unusual in its proximity to development. Solar sites are often located out in the country, far from urban areas. Alamo 2 was developed with the San Antonio River Authority on land near the Upper Martinez Creek Wastewater Treatment Facility. The solar farm is surrounded on two sides by homes while a school abuts the property on another side. As you might expect, the sheep are good neighbors – passive and “ba-a-ashful” to visitors who may find their way on to the fenced site. OCI Solar Power brought in two herding dogs, both Great Pyrenees mixes, to keep a watchful eye on the property and deter unwanted visitors. We’re looking to name one of the dogs! You can help us choose by casting a vote in our Name that Solar Sheepdog Poll. Thanks for the comment and thanks for reading our blog posts. More coming soon!